The California Pepper Tree has the lushest appearance – its gracefully pendulous branches resemble those of a traditional weeping willow. However, it requires only a fraction of the water required for the willow to survive. In fact, once established, a California Pepper can live entirely on Santa Barbara’s natural (and often limited) rainfall! 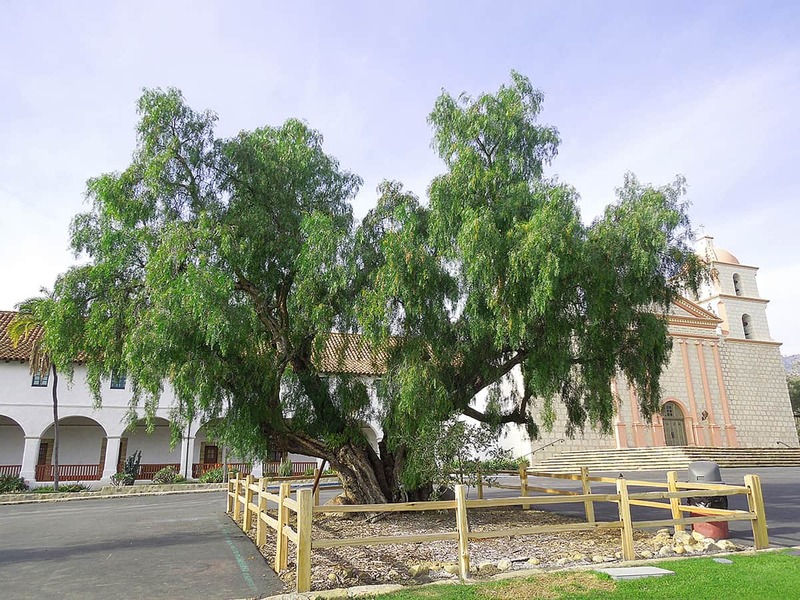 It was probably one of the first trees introduced in town, since it was originally brought here by the Mission Padres. Though native to the arid Andean Mountains of Peru, Argentina and Chile, it is now found in most of the milder climates of the world. It is commonly called a “California” tree, because it is found in most of California, and a “pepper”, because of its fruit, which is sometimes mixed with the regular black or white peppercorns in commercial culinary pepper blends. Its botanical name is Schinus molle – “Schinus” is from the Greek word schinos (the name of the pistache tree that it resembles) and “molle” is its Peruvian name. It is a fast-growing tree when young and can reach a height and spread of 40’. It doesn’t like too much water, since it is susceptible to root rot. Therefore, it makes a perfect tree to include in xeriscape gardens along with other drought-tolerant plants, like succulents, aloes, and cactus. Its small, white flowers that bloom in February are rather inconspicuous, but the red and pink peppercorns that hang in clusters are certainly noticeable later in the year. The slender leaves push out as a shiny yellow-green, then turn to a darker green, and are retained all year. The gnarled, gray-brown bark peels in thick flacks with age. California Peppers can be seen throughout the City, from the beaches to the upper Riviera and the foothills, as both a street tree and as a home garden tree. The most mature specimen is probably the grand one in front of the Mission; it is over 100 years old! The magnificent tree right in front of City Hall is also over 100 years old. You can see younger ones planted as street trees in the 700 block of Santa Barbara Street, the 200 Block of East Pueblo Street, and the 2200 Block of Garden Street.